Come up the tower and learn to ring! This page lists resources to help you. There are lots of books about change-ringing, many of them published informally and quite cheap. The Central Council of Church Bell Ringers has a very extensive bibliography online. 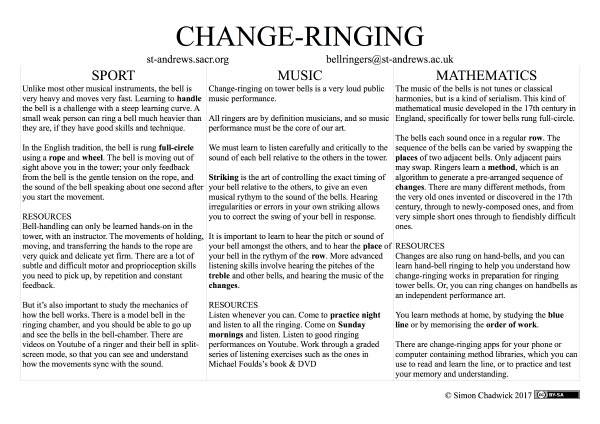 John Harrison’s four articles on ringing and music are a really useful overview of what change ringing is all about. There is a very useful graded series of listening excercises in the DVD/book Come on! Listen to it! by Michael Faulds. You can order online from the Whiting Society. I strongly recommend you get and work through these. Sometimes we use the worksheets from this book in the tower. Youtube is a great way to listen to ringing on different numbers of bells from different towers, from rather lumpy local bands to the absolute stunning proficiency of ringers at the major cathedrals. These two videos show a bell on the test stand at Taylor's bell foundry. You can see how the bell swings and speaks. These two videos show a very useful split screen view of how the bell is swung to the "mouth up" position, ready for change-ringing. This is a heavy six, so they turn slower than the light bells at St Andrews. The bell nearest us is the 5; you can also see the tenor to the left. The tenor stays in sixth place all the way through. You can watch how the ringer of the five controls the bell, making it drop before the balance point to ring faster when hunting in, and letting it rise pretty much to the balance to ring slower when hunting out. You can also hear that the striking is a bit uneven; the ringers are concentrating too much on looking for the bell they are following, and not enough on listening to their place. These video show some of the best ringers in the world, on the best bells in the world! Watch and listen for inspiration! The music in this performance is at the level of a top symphony orchestra. There are a number of apps you can get for your computer or phone to help you learn methods, or to practice them in real time. Abel for Windows (simplified versions also for Mac and iOS) is a great way to practice at home. You can control a bell (or a pair of handbells) with your computer keyboard. We can help you set it up and work out how to get started. Methodology for Android works as a method library and also includes silent as well as real-time practice options. We can help you set this up and work out how to use it.